"A thousand year army…" Paramount has dropped the first official trailer for a movie called Overlord, a secret project from Bad Robot made by Australian filmmaker Julius Avery (Son of a Gun). This project was first rumored to be the "new Cloverfield movie", that could be altered in post-production to fit into that universe. But Paramount has decided to release it as its own movie, sticking to the original script that was filmed. 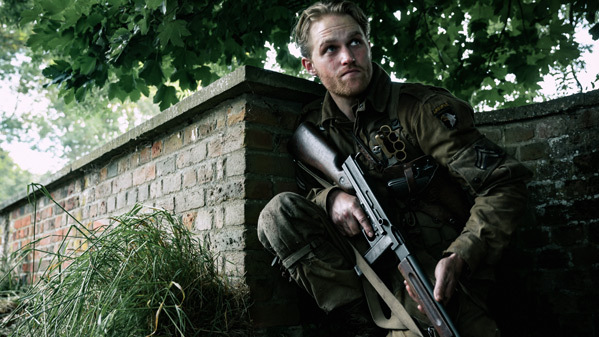 Overlord is about a group of WWII soldiers who end up stuck behind enemy lines after D-Day. They discover the Nazi's secret plans to create more powerful soldiers using supernatural forces. Starring Jovan Adepo, Wyatt Russell, Pilou Asbæk, John Magaro, and Mathilde Ollivier. I'm way, way in for this - especially considering it's coming from Bad Robot, they've been cookin' up something gnarly for us to enjoy. No synopsis is provided yet. Alternative description: On the eve of D-day, US paratroopers drop in behind enemy lines, to infiltrate a small village. Unfortunately, they discover the Nazis are experimenting with supernatural forces to fight them. Overlord is directed by Australian filmmaker Julius Avery, director of the film Son of a Gun previously, as well as numerous award-winning short films. The screenplay is written by Billy Ray and Mark L. Smith; story by Billy Ray. Produced by J.J. Abrams at Bad Robot. Paramount will release Avery's Overlord in theaters everywhere starting November 9th later in the fall. First impression?